OK, this one is beautiful. I am quite pleased with my result. 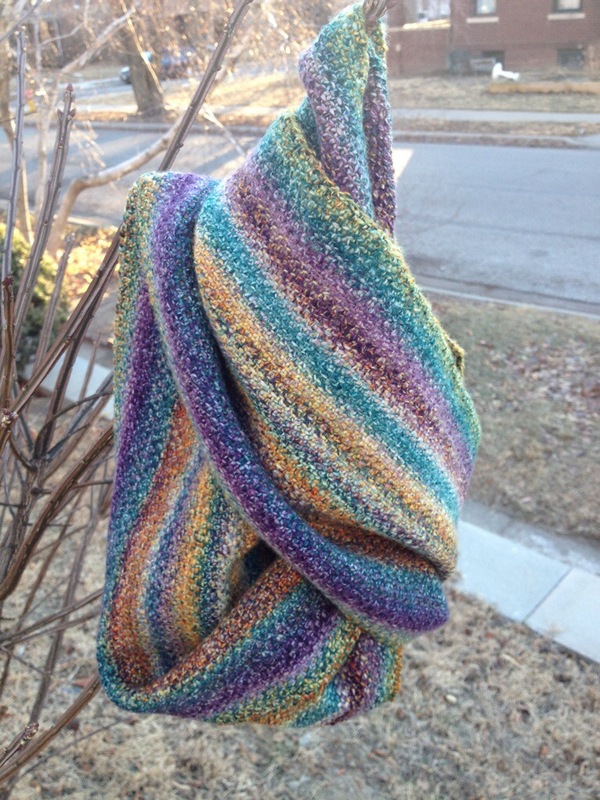 I took my flower shop inferno 3 ply handspun and started a linen stitch cowl before Christmas. I didn’t get very far because linen stitch takes forever, and because other projects got in the way. But, I finished finally this week, and I couldn’t be happier with the result. The linen stitch is so perfect for such a colorful and variegated yarn, it makes each color fade into the next even more effectively than handspun just on its own. And, because I’ve been talking about the inside of the cowl this whole time, I am going to show that off too. Just stunning and rich! I love it! 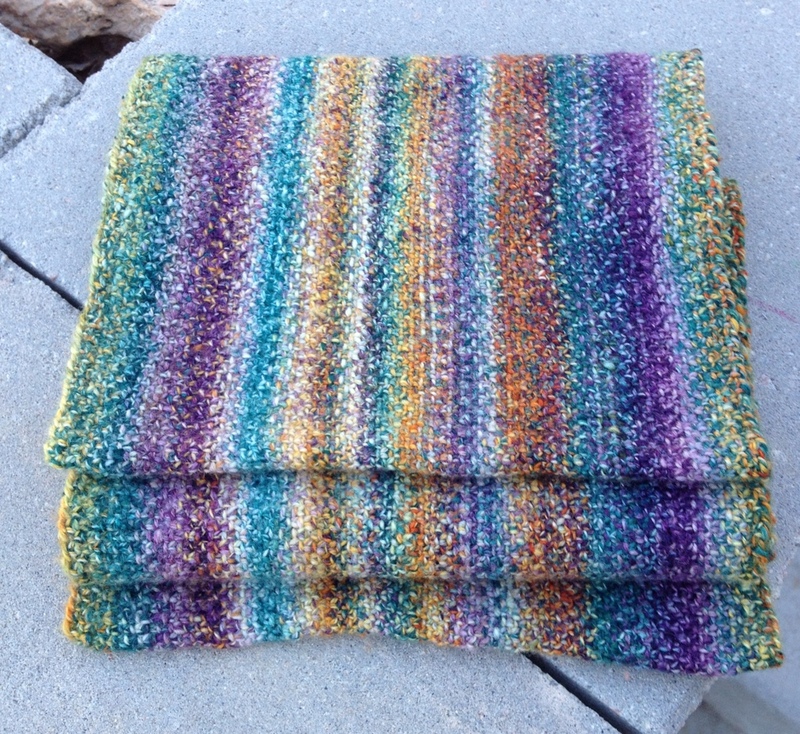 Awhile back I decided that I wanted to weave a piece that would showcase my corespun yarn. 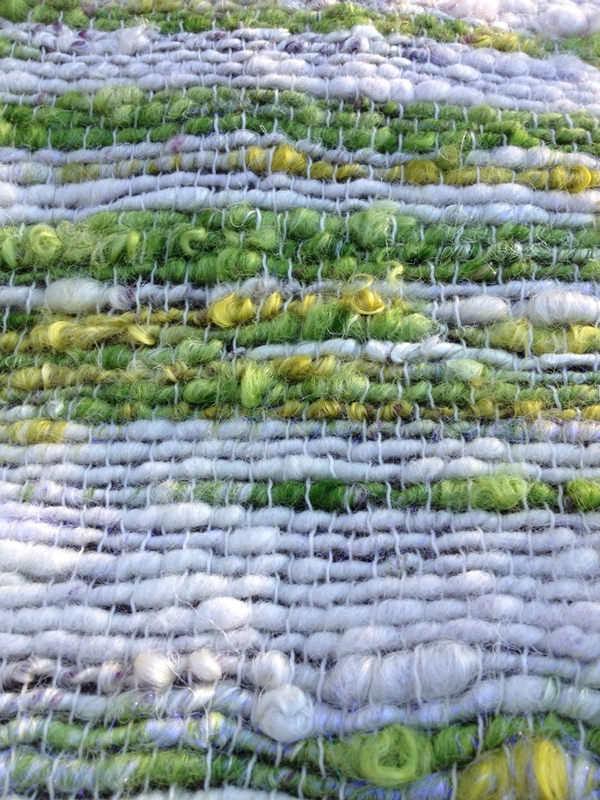 My idea was to use a thin yarn as a warp and the corespun as weft. I wanted to capture the corespun gently between the warp, putting the warp on display. 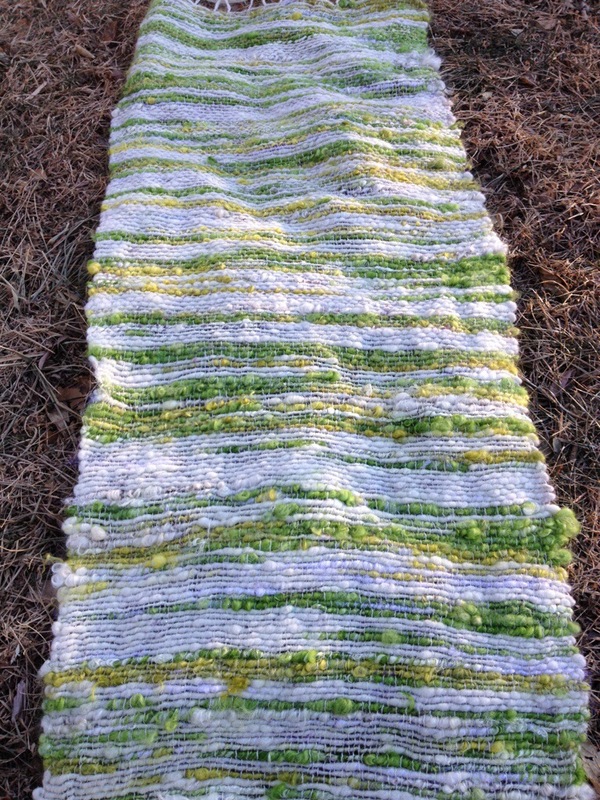 I used habu textiles cotton for the warp. This turned out to be a bad idea. Lesson 1, not all cottons are created equal. Just because it is cotton doesn’t mean it is warp appropriate. Lesson 2 was how to fix a broken warp thread. 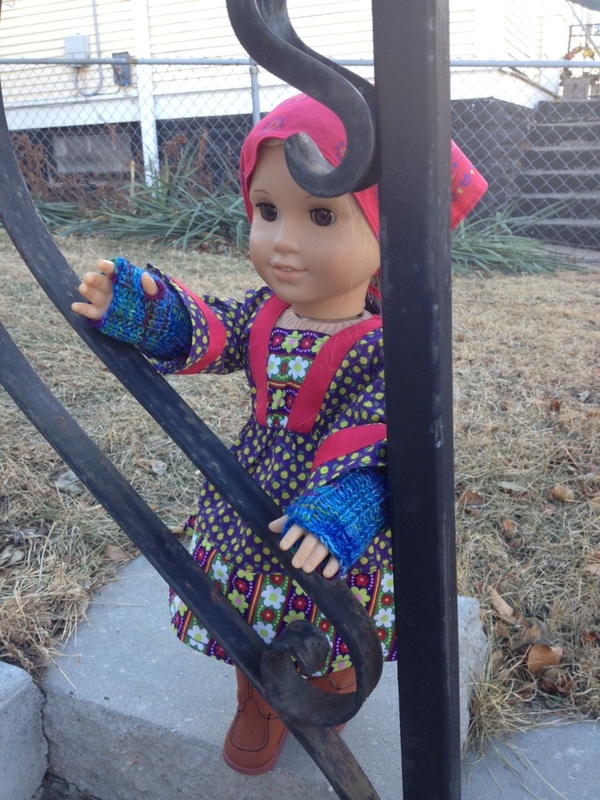 Not a bad lesson in the learning to weave department, but not one I am eager to learn again so repeatedly. This spent a lot of time on my loom because…I dunno…I got busy? And uninspired, and there was the fast knitting of the holiday season, and then I piled stuff up on my loom table and it was inaccessible without organizing all that stuff. Weaving went by the wayside until Bug started to repeatedly ask to weave on my loom. I decided I’d better get the project finished and off the loom so she couldn’t keep bugging me about it. That warp was way too tender for her to be weaving on it! I originally decided that I was going to make this into a wall hanging. After rearranging my living space for the umpteenth time, and removing my TV, I have open wall space that needs to be filled. The thing is, it is a bit too thin to fill that space properly. 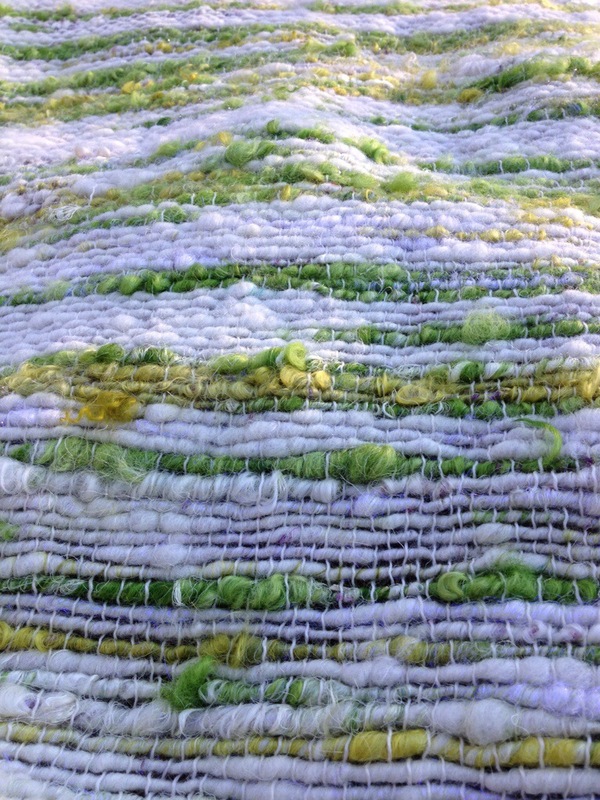 As such, my plan now is to do a series of 3 wall hangings out of handspun art yarn. I am still unsure of how to attach them to the wall, but I’ll cross that bridge when I come to it. And due to the fact I’ve got 2 scarves to weave before I get back to the wall hangings, I will have plenty of time to think it through and get creative. In any case, I’ve got a few pictures of the piece I am writing about to show off. It is still in an unfinished state, but it is washed and blocked. I spent Saturday at my loom. It has been a long while really, and I enjoyed my day of weaving immensely. I finished up a project I had on the loom, more on that later, and then started a new project. Awhile back I posted about the gradient I’d spun from dyeabolical batts, and how they reminded me of the label on a bottle of blue moon beer. I’d decided to weave this yarn with a gold handspun. 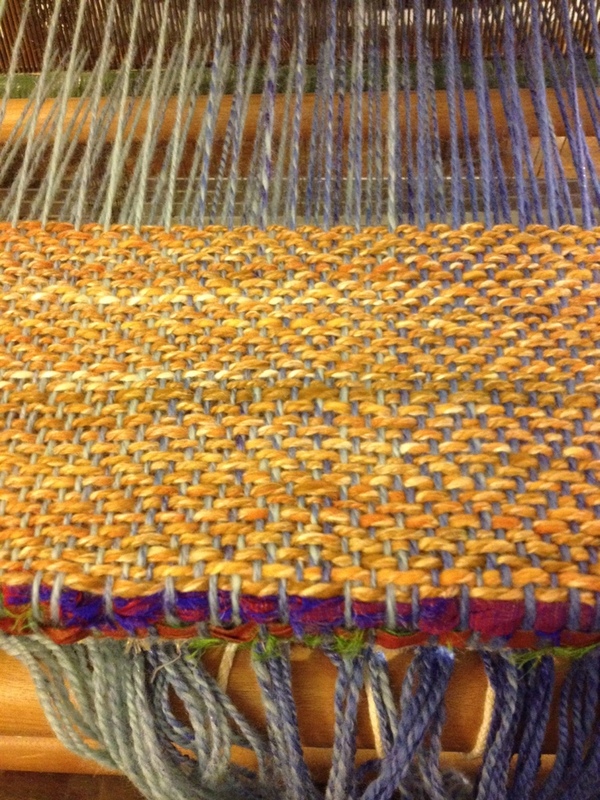 My idea was that the warp would be a vertical gradient, using the gold as the weft. I also decided to try my hand at an actual pattern rather than a plain weave. I put the yarn on my warping board, having done my calculations. I felt like it was taking too much space on the board. I had this vague feeling of something being not quite right but didn’t indulge that feeling and double check until I was almost done with the warping board. Sure enough, I was about 2 yards short. So, I removed the entire warp and began again. Once that was done, getting the warp onto the loom was a fairly easy process. I must admit, I like this part of weaving. It brings to mind the phrase “well begun is half done” each and every time I do it. I tend to take my time with this process and allow it to take as long as it needs to. I just hate the idea of making a mistake at this juncture. Since I am so new at this, I am in a constant state of learning. The lesson I learned here is that more contrast is necessary when working something that contains a pattern. On the right side, the pattern shows up well. But as the blue warp gets lighter, the pattern fades. This might seem obvious, but I was too excited about my idea to think it through. That being said, there’s still a chance it may change once the scarf is off the loom. 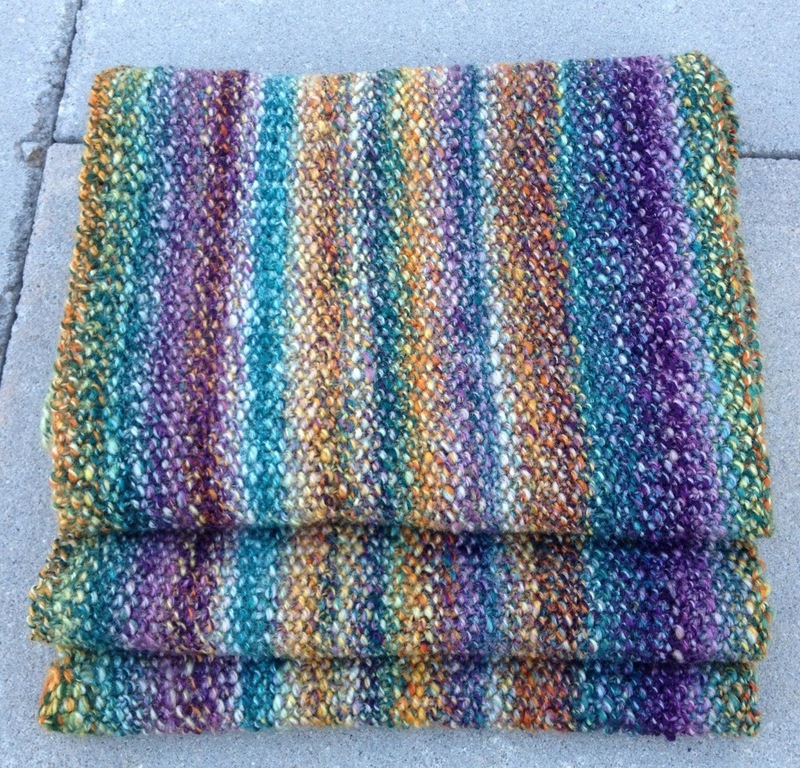 The handspun wool warp stretches quite a bit so I can only imagine it will also bounce back quite a bit. Once it does, there’s a possibility that the pattern may be more obvious. That being said, I really do not have the experience behind me to know if this hypothesis could be true or no. I think that might be what I am enjoying about weaving right now. There’s no predictability in it for me, it is ALL just experimentation. 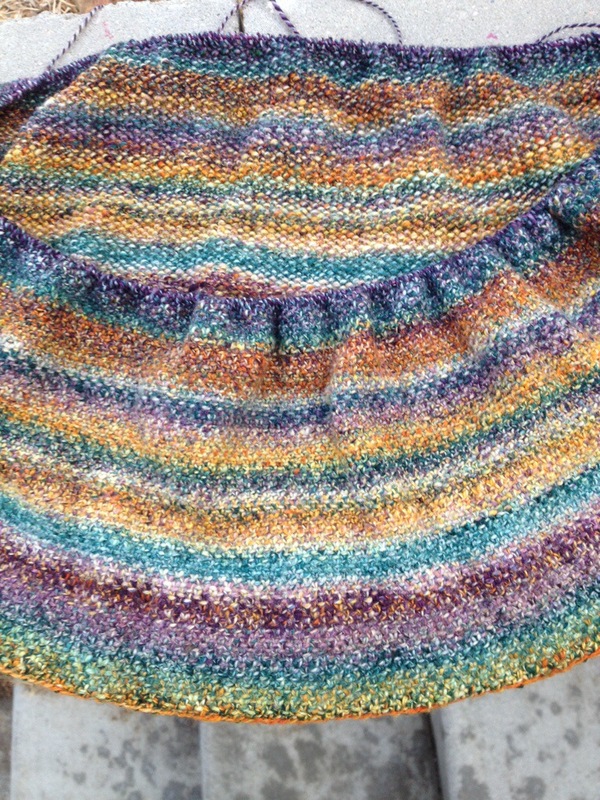 I keep plugging away at the linen stitch cowl I started awhile back. This one just thrills me to no end, the colors are so rich. 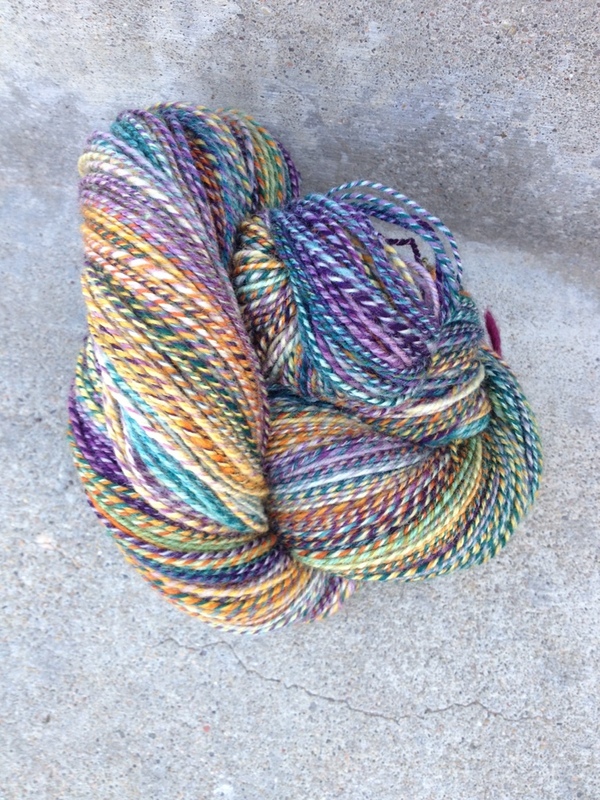 You may remember that it is a 3 ply handspun from dyeabolical’s flower shop inferno colorway. Just lovely and the linen stitch suits it well. I love that it would be no problem to wear this inside out as well, the back truly is as beautiful as the front. I really don’t have much further to knit, just a small ball of yarn left now. While I do have other projects on the needles, this one is getting my down time. My most mindless knitting time. I rather enjoy it. The only complication is after this much linen stitch, it is really hard to manage a plain slip stitch heel on a sock. I keep wanting to carry that slip stitch in front rather than in back, as the motion has become so natural while knitting the cowl. My father’s office has been particularly cold of late. Because of this, he’s taken to wearing his bike gloves for a bit of extra warmth while working at his computer. My mom told me of this and wondered if he might like a pair of fingerless gloves for the office. Of course, I am powerless to resist knitting for a family member “in need” so I got started immediately after I received his hand measurements. Since I work exclusively from stash these days, I pulled out some knitpicks wool of the andes I had in stash. I had to pair it with another color because there was no way I had enough for a full set of gloves. I don’t think the stripes look too bad, and since there was a pitifully small amount of main color left over, it was a good decision. My plan is to spend some time weaving on this lovely Saturday. It’s been awhile, and I’ve got an open wall space I hope to hang the current project from. Time to get a move on with it! 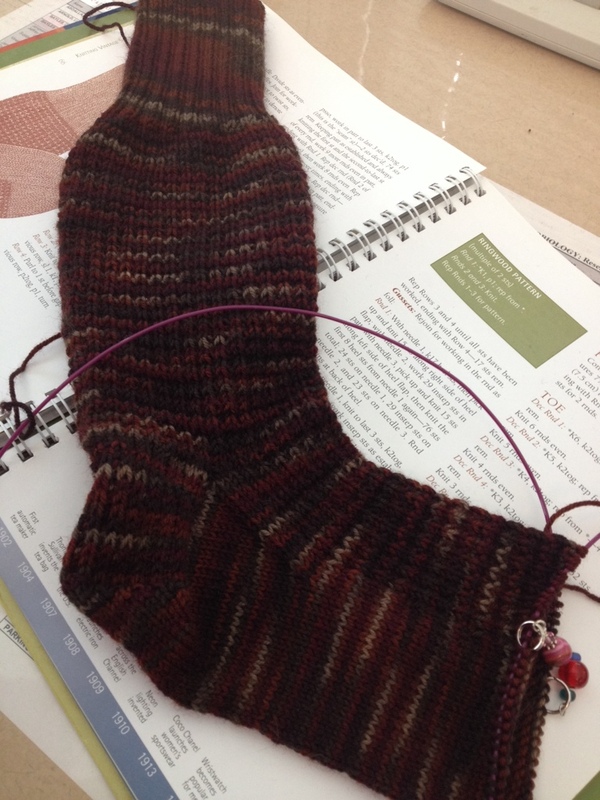 I’ve been banging out the sock at work again this week, and after Tuesday’s lunch, I am feeling pretty good about my progress headed down the foot. I need to start measuring. I feel like these are knitting at a pretty quick pace despite the fact that I am only putting in about an hour a day during the work week. 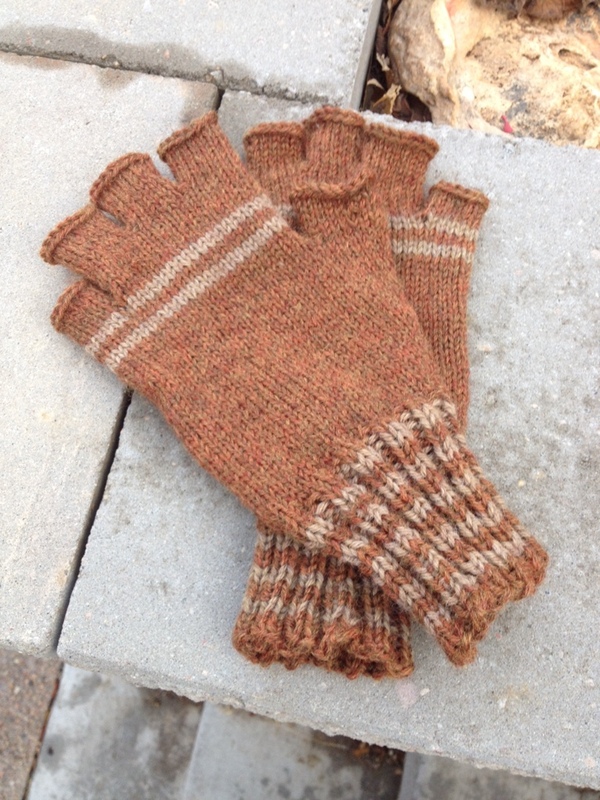 Julie asked me for a pair of fingerless mitts and she would not be dissuaded. I was not able to work on any other project until these were complete. I managed to accomplish some things I’ve been putting off this weekend which sets my week up well. I hope you all are having a great week too!